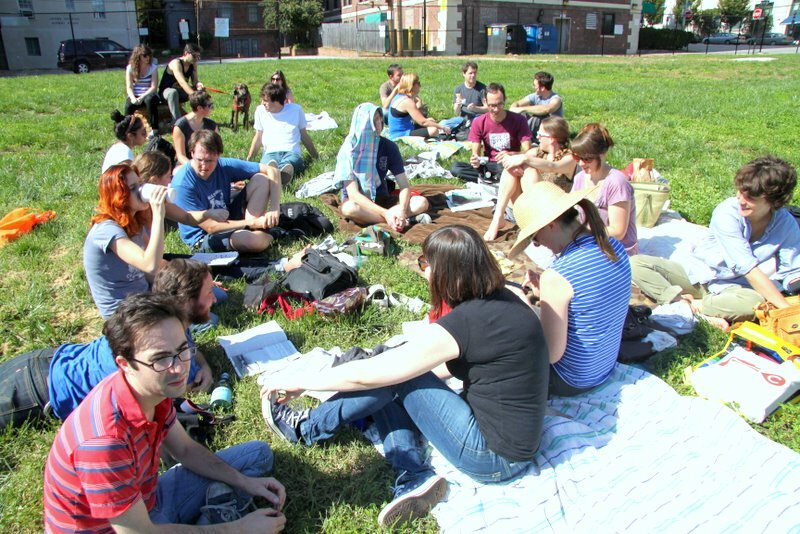 “Occupiers” picnic in land cleared by Johns Hopkins for condos that were never built. Officially, this protest had no connection to the Occupy Baltimore group that has been demonstrating and camping out down at the Inner Harbor since Tuesday, explained Willen and his co-conspirator, fellow designer Nolen Strals. As the two talked to reporters, a crowd that reached perhaps 30 people flopped on blankets spread on the grass enjoying sunny skies and unusually warm October temperatures in the low 80s. Frisbees flew, toddlers toddled, a couple of dogs bounded across the grass and the adults ate sandwiches, sipped San Pellegrino water and worked the Sunday New York Times crossword puzzle. Several kicked off their shoes. Bikes lay on the grass. Most said they heard about the event via emails and many had no idea what was there before the big expanse of green grass. Before it was acquired by developer William Struever and demolished in 2006, the parcel was “the closest thing [Johns Hopkins University] had to a fraternity row,” as the student-written Johns Hopkins News-Letter described it. There was a 24-hour convenience store, row houses and two converted apartment buildings that housed Phi Kappa Alpha and Alpha Delta Phi. Struever planned to build The Olmsted there, the last piece in his “Village Commons” project that includes Village Lofts across St. Paul St. (68 condos atop ground floor stores like Chipotle) and Charles Commons (student housing anchored by a Barnes & Noble bookstore). The Olmsted was initially proposed as an $83 million, 12-floor building with 107 condominiums priced as high a $700,000, along with 15,000 square feet of stores and a parking garage. The city had subsidized the project with$20 million in tax increment financing and bonds. Amid objections from Hopkins, the project was scaled back to smaller market-rate and affordable apartments. But no iteration of the Olmsted ever materialized. When the housing market collapsed in 2008, Struever dropped for a time from the development scene, leaving behind a trail of unfinished projects and lawsuits over loan defaults. When Hopkins purchased the 1.13 acre Olmsted site in 2009 for $12.5 million, officials there said they had no immediate construction plans for the parcel but “felt it was important to buy it when it was available.” Asked about eventual uses, officials mentioned surface parking, a parking garage and possibly someday classrooms or residential structures. But so far, the land remains vacant. Considering that the never-built Struever mixed-use project was named after Frederick Law Olmsted – who designed Central Park in New York and is considered the father of modern landscape architecture – it was perhaps apt that it actually briefly became a park Sunday. Several who were enjoying it said the area needs more public green space. The current property owners, meanwhile hadn’t heard about the brief park-i-fication of their land. “I did not know about it,” said Dennis O’Shea, executive director of communications and public affairs for Johns Hopkins University, who declined to comment on what appeared to be, technically, trespassing by the group. As for their plans for the property, that remains hazy. “Our intention is, at the appropriate time, to develop it in a way that benefits the university and the area,” he said. What might that be? “There will certainly be parking, which the community needs, and there will certainly be some retail, which the community also needs,” he said. Beyond that, he said, there would be some university use such as classrooms, office space or dormitories.